Although my Granddaddy passed away about a year ago, I wanted to share the story of his commitment to farming the way he was raised. Granddaddy grew up on this very farm around the turn of the twentieth century growing row crops as is so common on the Eastern Shore. Although farming was not his only income source, we grew a surplus of produce that my brother and I sold in the summer. 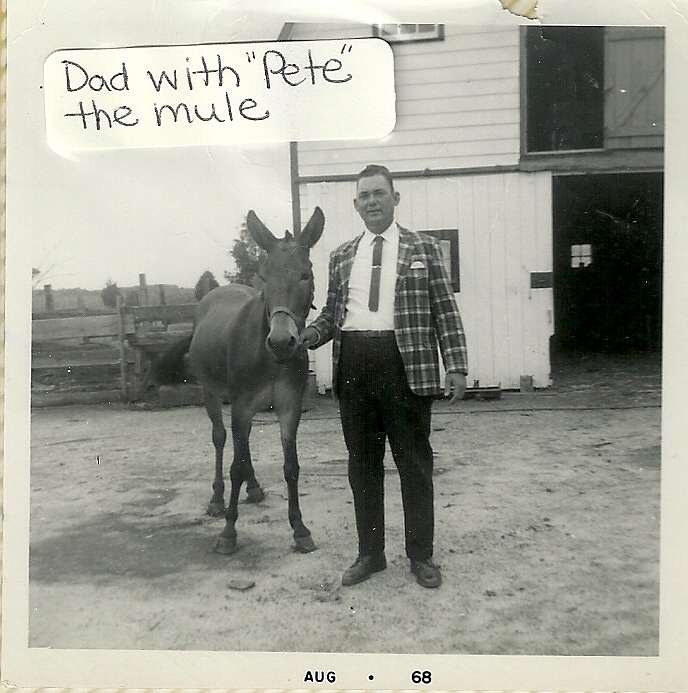 The unique part of this story is that Granddaddy started farming with a pair of mules, Dolly and Dan. Although Dan died before I was born, Dolly was a big part of my childhood, gently pulling the plow or the wagon, depending on what he needed. My friends were hoisted onto her back or offered a generous hunk of watermelon, warm and fresh from the field, speared on his pocketknife. When my brother and I were children, Granddaddy would harness Dolly to the sleigh or to the wagon in the local Christmas parade. Granddaddy also showed us how to plant by hand, hoeing rows, spacing seeds out, covering them, and letting us walk over the row with bare feet. Around my birthday in the Spring we'd pick strawberries, probably eating as many as we put into the quart baskets we'd sell. My Dad helped Granddaddy in the fields but mainly used the old tractor. It's hard to put this way of life into 2,000 words so I'll stop here. I wanted to honor my Granddaddy and his way of life, his straw hat and overalls, his gentle encouragement - and to state my own commitment to a sustainable lifestyle and to growing as much of my own food as I'm able. Thank you for compiling these stories as too many of Granddaddy's generation is passing and it's up to US now.